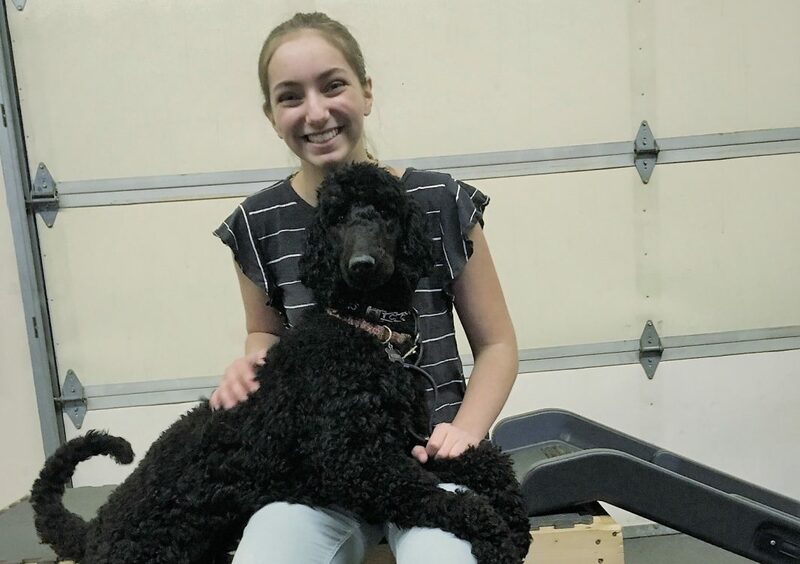 Block, tuck, visit, lap, look – all simple words that have special and important meaning for teenager Macy Blatter and the dogs she helps to train at Cascade Service Dogs. Since then Macy has been going twice a week to help with the training sessions. She has worked with about seven dogs so far. “I love dogs a lot,” says Macy. That love for dogs and this unique volunteer opportunity has led Macy to discover her calling at an early age. Macy is a sophomore at Black Hills High School, but she already has her career path mapped out. After earning her associates degree at South Puget Sound Community College through the Running Start program, Macy plans to attend Bergin College of Canine Studies in Penngrove, California. Bergin College is a school that specializes in dog training. She plans to earn a bachelor’s degree there and take the summer seminar that specializes in service dog training. After graduating from college, she wants to open her own service dog training center. “Service dogs are beyond amazing,” says Macy. “One I got close to, a standard poodle named Sadie, was so affectionate. Service dogs are supposed to constantly check up on you, and she was the best at that in my experience.” Macy worked with Sadie the longest. She spends a few weeks to several months working with the same dog until it is placed with its new owner. Macy has helped out at Cascade Service Dogs since December 2017, and she loves every minute of it. 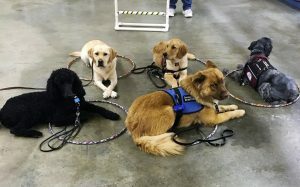 They specialize in training service dogs for veterans who suffer from post traumatic stress disorder (PTSD), traumatic brain injuries (TBI), and children with autism. Service dogs require a lot of training. It can take a year and a half to two years before a service dog is ready to be placed with its person. Even then there may be additional skills the dog and its owner need help with. There are many types of service dogs that help with all sorts of tasks. 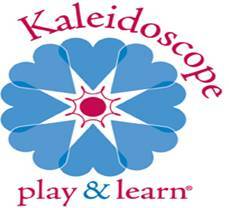 True service dogs are highly trained to aid people in performing specific tasks. Though service dogs and their owners develop a strong bond, it is not just comfort they offer. “They are people’s life support,” says Macy. During the training sessions, Sharon leads the group through various exercises. Macy helps work with the dogs to practice their skills. They work on basic obedience cues, such as heeling and staying, plus a variety of advanced tasks that are specific to the client’s needs, like turning on and off a light. Teaching the dogs to tuck under a chair can keep the dog out of the way when in a public setting and also offer its owner a sense of security. 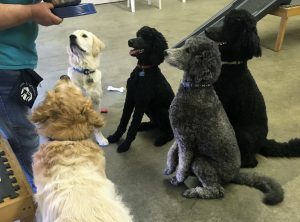 Clients may suffer from anxiety, so the dogs are taught blocking. Front or back blocks are when the dog places itself between its handler and a crowd to give the person a little more personal space. One recent client uses a wheelchair. Macy assisted with that person’s dog and helped it learn tasks like retrieving dropped items, carrying items, and even going potty on command. Visit and lap are two more cues Macy helped this dog learn. Visit asks the dog to rest its face on the person’s knees. “It helps to check the dog’s eyes, ears, mouth, or simply provide comfort,” shares Macy. Lap is another command where the dog rests its legs across the person’s lap. “This does the same as the visit command, but has a deep pressure therapy effect,” she adds. 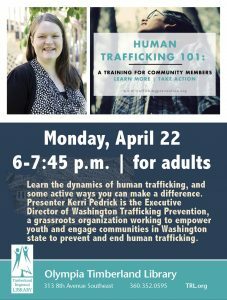 Part of the training involves real world experiences. The dogs need to be obedient and attentive to their handlers at all times in public, and that means ignoring other people, pets, or any other distractions like loud noises. 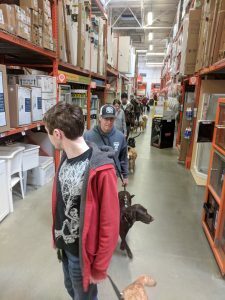 Macy and several other trainers took an outing to Home Depot to help acclimate the dogs to a public store setting. Macy also helped Sharon work with a dog to get on and off the bus in downtown Olympia. Helping out at Cascade Service Dogs, Macy has gained experience in caring for the dogs as well. She’s learned how to handle their food, groom the dogs, brush their teeth. She has even shadowed Sharon on two trips to the vet. Macy recognizes she is not the only one who loves dogs, but she cautions that being out in public with a service dog can be challenging because people want to interact with the animal and its handler. “If a dog has a vest, don’t distract it,” says Macy. “Avoid it and don’t make eye contact.” Most people with service dogs prefer not to be approached or asked about the dog or their condition. In fact it is not legal to ask about the person’s condition or reason for having a service dog. “To someone with major anxiety, that can cause stress on them,” Macy ads.